The first solo exhibitions of important Papunya Tula artists Johnny Yungut Tjupurrula and Kanya Tjapangati will be presented together at William Mora Galleries from 13 February 2003. Johnny Yungut Tjupurrula is a senior artist for the co-operative, born around 1930 near Tjungimanta, north-east of Kiwirrkura. During his youth, he led a nomadic lifestyle, traveling with his family between the area around Kiwirrkura and Lake Mackay, before moving to the Papunya settlement on its establishment in 1959. 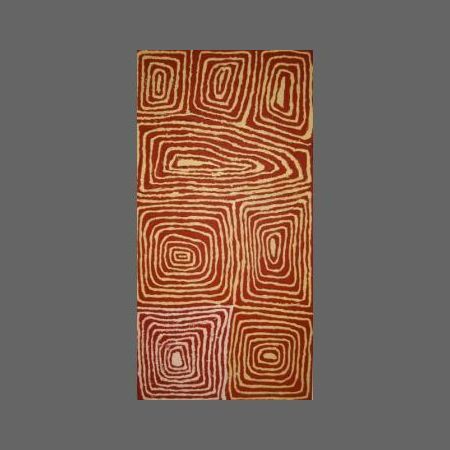 His paintings depict the dreaming stories and the travels of the Tingari learned during his own travels, using the traditional concentric circle and line design and diminishing square design in subtle and unusual colour combinations. He has participated in group exhibitions since 1997, in Alice Springs, Sydney, Melbourne, Adelaide, Darwin and Brisbane, and overseas at the Centre for Contemporary Art in Warsaw, Poland. Kanya Tjapangati is a younger artist, born around 1951 near Jupiter Well. He works in an individual, evolving style, characterized by a jazzy, geometric use of line and absence of dotting. While traditional designs, such as the diminishing square, often underlie his work, he provides a novel interpretation of traditional styles, and at times departs from them radically. Kanya began painting on canvas in 1981, and his work has been included in group exhibitions in Melbourne, Brisbane, Canberra, Alice Springs and Adelaide.